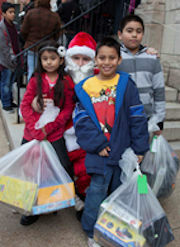 Washington, DC – For Thursday, November 28, 2017 – On December 16, 2017, Central Union Mission is scheduled to distribute gifts to 1,300 English- and Spanish-speaking children at our Operation Christmas Miracle program, but this year we are unusually low on Christmas donations. We need gifts for 540 children! Giving Christmas gifts to needy children is a Central Union Mission tradition that goes back to at least 1925 with First Lady Grace Coolidge. This is the first year, however, that we’ve needed to ask the public for help facing our shortage of donated Christmas presents. You can be the Christmas miracle in a child’s life. For more information, please visit Operation Christmas Miracle. Media is invited to interview Operation Christmas Miracle parents and attend the gift distribution on December 16. RSVP requested.